Devbridge announced today the launch of a new website for Berlin Packaging (www.BerlinPackaging.com). 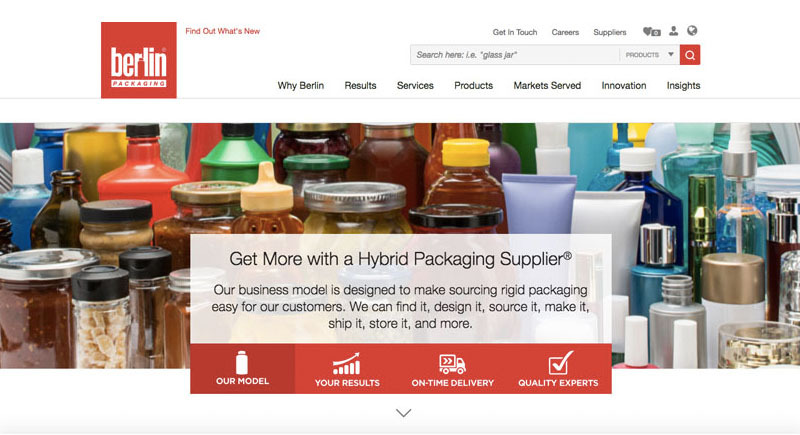 Berlin Packaging, a full-service supplier of plastic, glass, and metal containers and closures, was looking to improve its corporate website via enhanced features and functionality as well as a better overall user experience. Berlin Packaging wanted a partner that would work side-by-side with its internal team and that could quickly deliver a dynamic, powerful site. The team partnered with Devbridge due to Devbridge's agile approach, development and design experience and Better CMS platform—a fully responsive, open source, content management system. The new site is fully responsive, optimizes information management, and features a modern look and feel. Importantly, the site fulfillsBerlin's expectations of making it easier for customers to explore products and ultimately offering a better customer experience. Berlin Packaging expects to further increase customer engagement and revenue as a result.